NORCROSS, Ga. -- You know the saying, "if you do what you love, you'll never work a day in your life..." Chris Campbell is the perfect example. 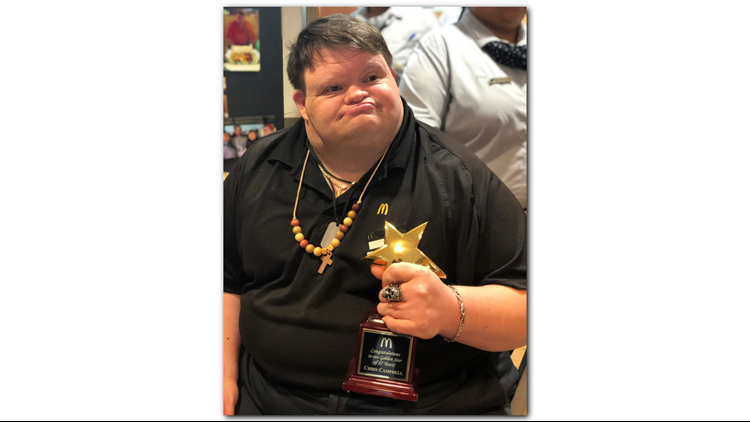 Chris has been working at the same McDonald’s on Buford Highway for 27 years! But, Chris isn’t the only golden star with a disability. Countless disabled employees shine day in and day out; thus, sparking the fight for more inclusive work spaces in the United States. Recently, Walmart announced they will be eliminating greeter positions in 1,000 stores nationwide and replacing them when “customer hosts” with more physically demanding responsibilities. After a week's worth of bad publicity, Walmart said they would make "every effort' to find a role for disabled workers. Advocates for people with special needs say it’s a huge blow to the elderly and people with physical disabilities. They say the disabled can still work with high efficiency and Chris is working to prove just that. “He’s got determination, a lot of fight, and he’s going to the top no matter what… and no one’s going to stop him!” Chris’s mother said. In response, the Down Syndrome Association of Atlanta released a statement saying people with down syndrome share the same hopes and dreams as everyone else. So, what’s next for Chris?